As I mentioned, I happen to have come across a whole big bunch of apricots. After making apricot syrup, I still found myself with almost a whole box of apricots... quickly heading south. So, it is always a good investment to stock the pantry full of jam while the fruit is ripe. The last few batches of jam that I made included pectin, and so I decided to make a batch of jam without it this time. Why? Because the pectin method was working just fine for me. And if it ain't broke, there is a chance that I am going to break it very soon. There is a very subtle difference between jam made with pectin and jam made without, but you would probably never be able to tell them apart. The main difference is how long you spend cooking it. Pectin makes it jell up right away, and so if you don't use it, you have to cook it for a long long time while the water evaporates and the fruit's natural pectin is released. You also don't have to remember to buy a package of pectin while you are at the market, or spend the $4-5 that it costs. At any rate, I went for apricot jam sans pectin. Almost all fruits can be made into jam with just three ingredients: fruit, sugar, and lemon juice. This was no exception. 6 cups sugar (more or less, depending on how tart you like it. Mine has a tartness to it, but won't make your mouth pucker by any means) You can't go too much sweeter, though, without running into trouble getting it to set. Wash apricots, slice in half, and remove pit. Chop into bite-sized chunks. There is no need to be precise here; it will all mush up in the long run. Place the apricots into a large stockpot, along with sugar. Stir well to combine, and bring to a boil. (If the sugar isn't dissolving right away you can add a half-cup or so of water, but the fruit should be juicy enough). Add the lemon juice towards the end of the cooking process. 2. Freezer plate test: Put a plate in the freezer for a few minutes. Pour a little bit of jam onto the plate and put it back in the freezer for a few minutes. If it "wrinkles" and holds its shape a bit when you push on it, it is done. 3. Scoop up a bit with a cold spoon and pour it back in the pot. If it isn't done, it will stream off of the spoon. If it is done, it will "sheet" off of the spoon. Check out this great website that shows what a spoon looks like with jam "sheeting" off of it, as well as a chart for temperatures and elevations. 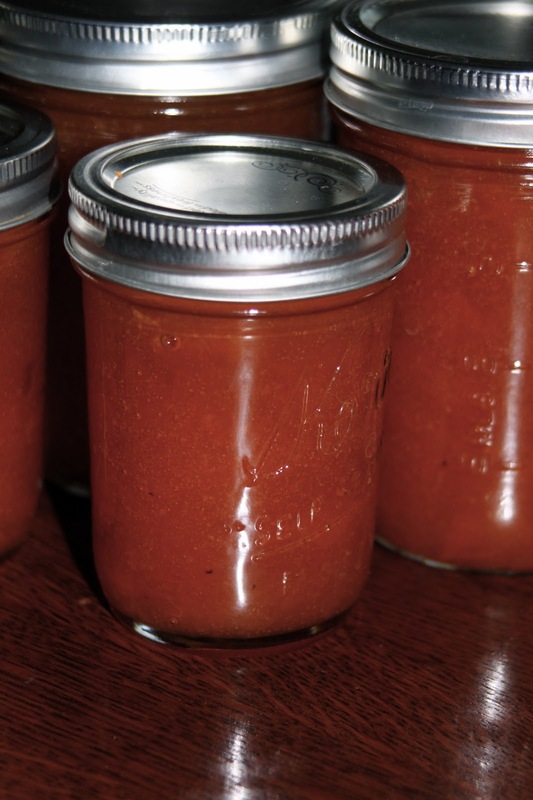 This jam will keep in the fridge for a few months... but try canning it! If you're like me, you don't have a ton of extra fridge space. And you are going to want to be able to eat this stuff all the way until next year's apricot season. 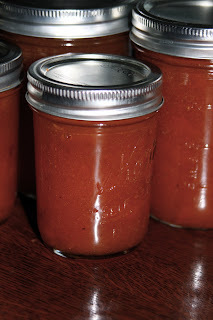 Canning is much easier and less daunting that you think it is. All you need is some jars, a big pot, and a pair of tongs. Ladle into hot jars (The jars need to be hot so that the glass doesn't crack when the hot jam is poured in.) Fill each jar to 1/4 inch from the top. Wipe the edges of the jar clean. Place a lid on each jar, and screw on the band until it is finger-tip tight. Place the jars into a large pot of water, and boil for 30 minutes. (for higher elevations, check this chart for processing times). The water level needs to be 1-2 inches above the top of the jars. After 30 minutes, remove from the water using a jar lifter (or tongs). Let them sit, undisturbed for 12-24 hours. You will know if they are properly sealed if you press on the lid and it doesn't give at all.